GetDivorcePapers.com provides professionally completed, 100% court-approval, money-back guaranteed Florida divorce forms. Just create an account, complete the interview, and file for divorce. Our case managers do all the work for you, and send the completed Florida divorce forms when they are ready to be filed. It is essential for either of two parties to be resident of Florida for at least six months prior to filing the case. All papers are required to be submitted in the county of any of the two individuals. Florida covers no-fault based divorce cases and fault based divorce cases. Whatever the reason is, both the spouses are supposed to agree with the reason. Among no-fault reason, irreparable separation is the one. Fault based divorce cases mainly constitute mental illness of either of the spouses, dissatisfaction in relationship, and some sort of domestic violence. Extent to which either of the parent allows free contact of the child with the other spouse. Affection and emotion involved between the child and parents. How potentially fit is either of the parents to take care of the child's education, food, and shelter. Health conditions of both parties. Any symptoms of domestic viciousness. Will of the child to live with either of the parents depending upon his or her age and mental growth. Florida defines itself as an equitable state. This states that the separate property of the spouses remains with them without any division in it. This property includes the property acquired by the individuals before their marriage or got in inheritance and gifts. Property acquired after the marriage is divided equally between the two spouses unless it deprives the spouses of certain rights and justice. In this regard, no prior misconduct or blames are considered. 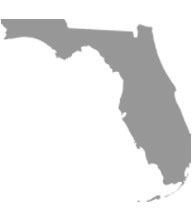 State of Florida also provides either of the spouses with the necessary support if it is required by the spouse. In this regard, income of the payer is considered along with the expenses required for the betterment of the receiver. However, this support can be either temporary or permanent unless the beneficiary gets stable enough. Florida has the rights to order either of the parents or both to pay for the child support. This decision is taken after analyzing the monthly expenses of the child and the income and financial standing of the parents. If the couple has minor children that are fully dependent on them, then they might be asked for the mediation for another three months for the counseling. There is no need of a lawyer when applying for divorce in the state of Florida. A divorce case which is filed without any help of an attorney in any of the states is known as Pro Se Divorce. Literally, Pro Se is a Latin phrase and it means "on her or his own". Process of getting the divorce without the help of lawyer may vary from one State to another. These types of divorces are perfectly legal and enforceable in Florida, and are actually very convenient. Usually, once settlements have been made regarding property distribution and custody matters among the spouses in case of a mutual divorce, Pro Se Divorces are filed.